Cut okra into small pieces. Heat oil in a pan , splutter mustard seeds and add curry leaves. Add chopped onion and saute till transparent. Add green chillies, garlic and chopped okra and mix well. Add turmeric powder and salt, mix well and cook in low flame. My favorite vegetable ever..Whatever you do,I am ready to have..looks real delicious here. Super yummy and healthy vendakai.. Healthy and delicious thoran,my favourite veggies. Yummy thoran .. 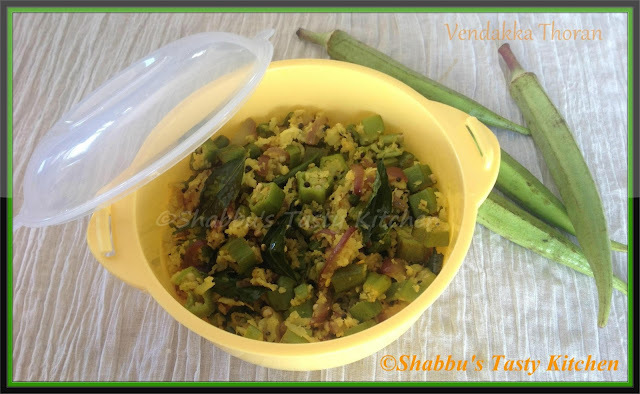 I love it with sambar rice or curd rice..
delicious.. great summer recipe to start with..
Vendakka thoran looks adipoli. My Favorite thoran. Simple and healthy ! Love it. delight on aplate..great with rice.